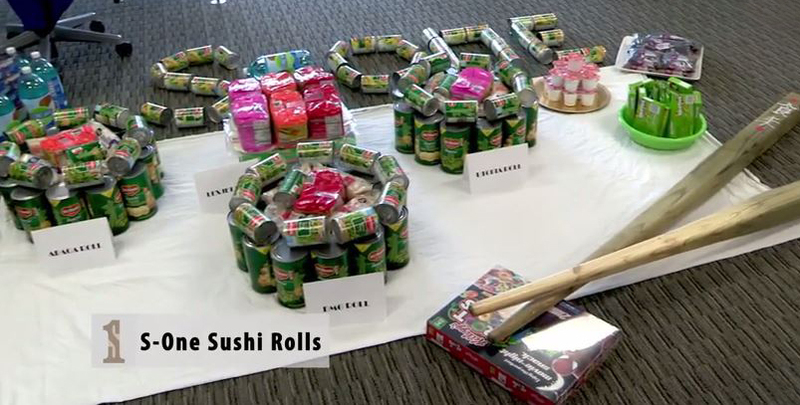 In its second annual holiday food drive, S-One Holdings Corp. employees teamed up to donate more than 2,400 pounds of food and compete in a good-natured “can-struction”-style building tournament on Nov. 17, 2014 to benefit All Faiths Food Bank. Throughout the fourth and fifth floors of the Ellis Building in downtown Sarasota, which houses S-One’s headquarters, the teams built a variety of structures including a sushi platter, a pumpkin pie, a mouse in a maze, an interactive advent calendar, a basketball hoop, a Christmas tree and to finish it off, a Thanksgiving Day parade featuring Tom the Turkey and Santa Claus himself. “Our team’s creativity never ceases to amaze me,” said Art Lambert, co-founder of S-One. S-One is proud to have helped All Faiths, which feeds 41,000 individuals annually, and we wish everyone a very Happy Thanksgiving!